I just caught the video of Maxine, that escaped cow from Queens who is now at Farm Sanctuary: http://www.youtube.com/watch?v=BH_c7JljsaM Seeing her and hearing her story reminded me of how I became a vegetarian. I used to love steak, bacon, chicken, you name it - I came from a family that loved meat and did not really consider a meal complete without it. Then I got my two dogs and started exploring the state with them. I loved taking my fur-babies to new environments and introducing them to a wide variety of experiences. One of our discoveries was a small farm run by a University 40 minutes from my home. Visits to the farm quickly became a regular weekend treat for me and my dogs. The natural smell of hay and barn animals went from wrinkling my nose, to being a scent I craved. My dogs and I would walk for hours along the rough dirt roads, passing fenced fields containing goats and cows. The goats always bleated when we approached, gathering at the fence and poking their velvety soft noses out to be patted. Their babies were some of the most adorable, fuzzy little beings I had ever seen. The cows were shy with me and my Jindo, but they seemed absolutely fascinated by my pit bull, whose black and white markings were remarkably similar to theirs (one of his nicknames was "the little cow"). They would run up to him and lumber along the fence trailing him in a herd. He was initially frightened by their size but as time went by he became comfortable enough to allow them to nuzzle him. I remember how startled he and I both were the first time a cow extended her huge purplish tongue to lick him. Eventually, the cows also lost their fear of me and my Jindo; they would raise their bodies from comfortable sitting positions when we arrived, and greet us with their huge, solid heads. They adored attention and would vie with one another for key positions from which to receive my pats. The grown pigs were rather indifferent to our visits until I began to feed them handfuls of clover from the fields; then I became their best friend. At first the sows would keep their tiny piglets from approaching me but as they grew to trust us, their babies were allowed to run up for pats and clover too. The more time I spent with these farm animals, the less I wanted to consume their brethren. Before I had ever seen any footage of factory farms or been introduced to the world of animal welfare, I decided on my own that I was going to stop eating meat. One day at the farm as I patted my cows I announced out loud to them, "I am not going to eat you guys any more!" They looked back at me silently with their soft eyes. As I entered the world of vegetarian (and now aspiring vegan) awareness, I discovered what happened in those mass slaughterhouses. I watched my first video of piglets being slammed to concrete floors; cows hanging alive by one ankle as their throats were cut; and battered chickens trapped motionless in cages; through my tears of rage I thanked God that I no longer ate meat. I prayed that people would wake up and see what was happening. I started telling my family about the sentience of all animals, and appreciated my farm visits more than ever. I wish now I had videotaped or at least taken photos of my dogs with the farm animals, but I never imagined I would lose both dogs within two years of one another. I blankly assumed they would live to be 18, dying peacefully in their sleep of old age. 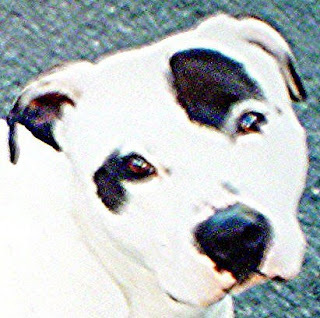 When my pit bull died unexpectedly before his eighth birthday, I was unable to return to the farm for many months. It was too painful to visit the scene of so many joyful hours. One day I finally gathered the nerve to make the 40 minute drive. My Jindo and I stepped out onto the beautiful green fields, and a wave of grief washed over me as my nose caught the familiar scent of hay and barn. We walked to the cows first. I am certain it was my imagination but they seemed to be looking for their tiniest little honorary cow. Through streaming tears I explained to them that their favorite fellow had passed on. A passerby might have stopped short at the sight of a crying woman holding her Jindo and talking to a herd of cows, but I didn't care. I looked into the eyes of the herd and I felt comfort; I felt some closure. They had known my dog, and my dog had known them. We had shared our lives, and they had changed mine forever.